Mangroves are one of the most threatened ecosystems in the world. Unfortunately, mangroves in Costa Rica are no exception – every day, mangroves around the country are devastated due to human activity, despite being declared protected areas . 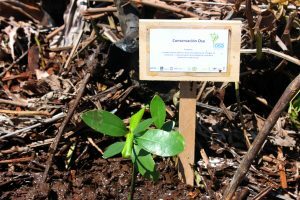 There are more than 80 protected mangroves identified in Costa Rica, representing approximately 41,002 hectares (101 318 acres), of which 99% are located in the Pacific. 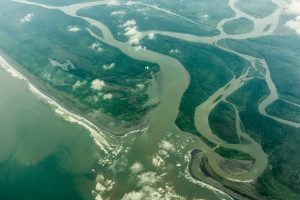 Just north of the Osa, Térraba Sierpe National Wetland stands out as the most extensive mangrove in the country, with an area greater than 16,000 hectares (39 537 acres) – representing almost 40% of the mangroves reported for the entire country! The Térraba Sierpe National Wetland was declared internationally important in 1995 by the International Convention on Ramsar Wetlands and through the Costa Rican Forestry Law. Through this designation, it became prohibited to cut or exploit the timber resources of this ecosystem. Prior to this in the 1970’s, timber was legally extracted in this area for the production of coal, firewood and construction materials, as well as bark for tannins and molluscs. This, combined with a large illegal extraction decimated much of this valuable mangrove forest. 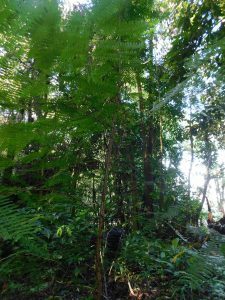 In the 1980’s, the extraction and use of wood products from Térraba Sierpe Wetland led to a massive establishment of the mangrove fern Acrostichum aureum – a native species that has a tendency to become overabundant with lots of light. In a healthy mangrove ecosystem, this mangrove fern coexists and is regulated by the shade of the large mangrove trees. 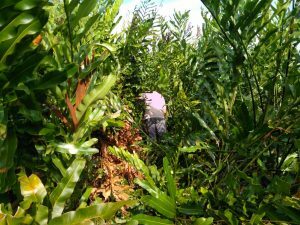 However, once mangrove trees are cut, the fern takes advantage of the light and space and becomes difficult to eradicate. High densities of this fern then prevent smaller mangrove saplings to grow and to establish healthy mangrove trees. Thus, in order to restore the mangrove ecosystem back to a more natural state, active restoration strategies must include removal of this aggressive fern. Mangrove fern is regulated by mangrove trees. In a healthy ecosystem, the fern is more easily managed and lives in balance. Without the presence of mangrove trees, the mangrove fern takes over. 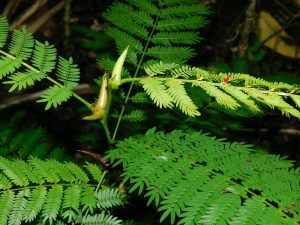 As an opportunistic species, this fern becomes overly abundant and grows very tall. As Osa Conservation has been committed to protecting and restoring the Térraba Sierpe National Wetland, we plan to restore 50 hectares (20 acres) of mangroves that are currently occupied by the Acrostichum fern. 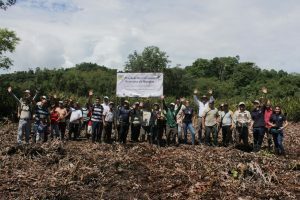 As part of our new project called “Effective Strengthening of Mangrove Ecosystems in Costa Rica (Terraba Sierpe) and Improvement of the Quality of Life of the Local Coastal Population,” we aim to restore the structure and functions of this important mangrove ecosystem and help empower local communities to responsibly manage the non-timber resources offered by the mangrove. We had a wonderful time recently celebrating this project. Working a with a wonderful group of partners, we are grateful to all of the participants who came out to support the project and we look forward to continuing to collaborate on this important effort to protect and restore this vital ecosystem. 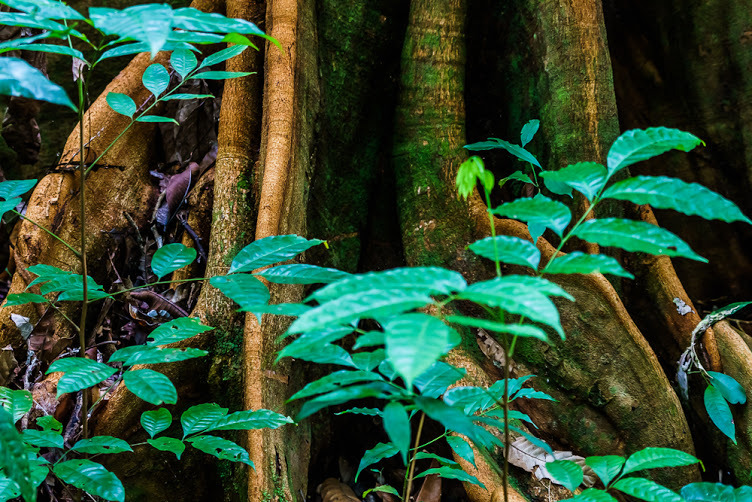 One of Osa Conservation’s objectives is to support the conservation of at-risk trees through the conservation ex-situ program (such as the creation of a botanical garden) which is a supplement of the in-situ ecological restoration and rewilding program that we continue to pursue. It has been more than a year since we planted the seeds of a Vachellia allenii tree, locally known as a cornizuelo (the tree of the horns). 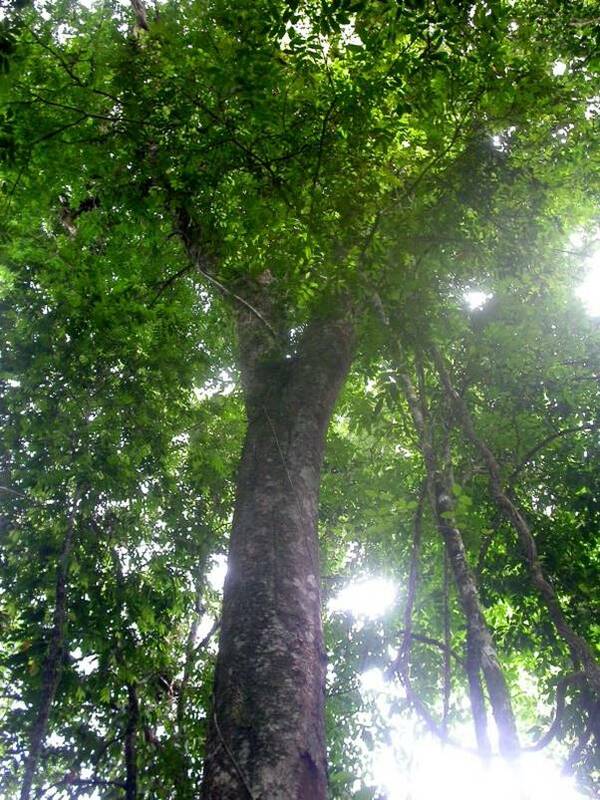 This tree can be found growing abundantly in both primary and secondary forests and can reach heights of 25 meters. The cornizuelo, characterized by spines that grow in twos, looks like a pair of horns. This species is endemic to Costa Rica and is categorized as endangered (EN) by the International Union for the Conservation of Nature (IUCN). Its greatest risk is the loss of habitat, which is a common consequence of deforestation. The tree coexists with a specific species of ant, the Pseudomyrmex sp., with whom it has established a very special relationship. In this case, the cornizuelo brings refuge and food to the ants and their offspring. The large, hollow spines grow to become an ideal site for the ants to live, reproduce, and feed. The plant produces small, yellow bodies containing sugar and proteins that serve as abundant and delicious food sources. 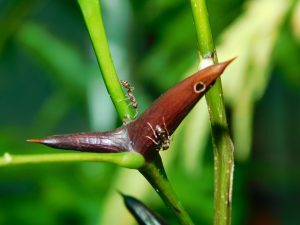 The ant by its part protects its host plant against the attack of herbivores, particularly insects, and further prevents other plants from becoming its competitors for sunlight, space, and nutrients. When something touches the plant, hundreds of furious ants appear, dispersing to protect the plant from intruders. The furious ants produce a free space of vegetation around the cornizuelo by using their jaws to cut vines and eating seeds and seedlings that attempt to grow around them. Living together has become a matter of survival as much for the plant as for the ants. Over the course of 9 months, we noticed that our cornizuelos did not develop. They hadn’t been colonized by ants, and possibly, were never colonized. Such was the case with a cornizuelo we planted in the station after throwing away the previous flowers. We then undertook a trip through Saladeros Ecolodge in the National Park of Piedras Blancas, where we found an area with many cornizuelos. As a first attempt, we decided to bring a sample of a seedling with all of its ants. Newly colonized cornice seedling. The horn-shaped spines show a hole recently made by an ant (Pseudomyrmex sp.). One time in the nursery, we collected the plant with ants besides our cornizuelos. The ants immediately started to explore and eat from the yellow bodies. After a few hours, they started to make holes in the thorns, and on the following day, all of the thorns had holes. Our cornizuelos started to grow rapidly, looking vigorous and filled with life. However, the ants disappeared in a month, probably due to the absence of a queen ant, or because the ants got lost while leaving to explore. 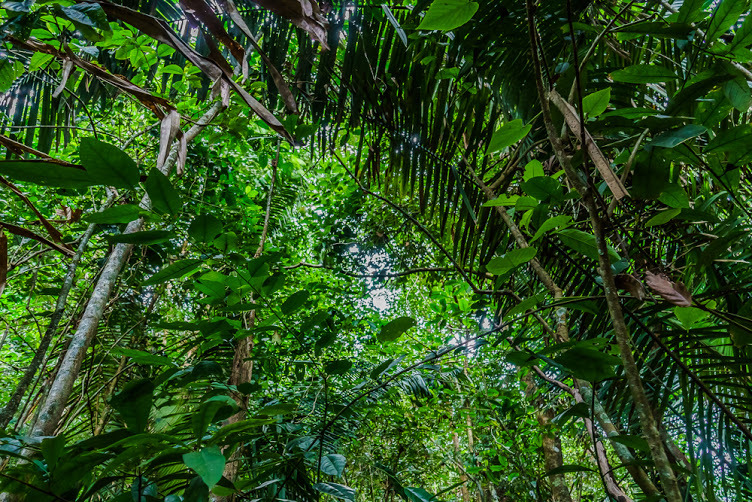 When you destroy a forest, you also destroy the mutualistic interactions between plants and animals that have spent hundreds of years developing. These interactions are very delicate and are difficult to recuperate and restore. Though our first attempt at rewilding this interaction did not do as well as we hoped, we continue to do more research so that the cornizuelos and their ants stay together. 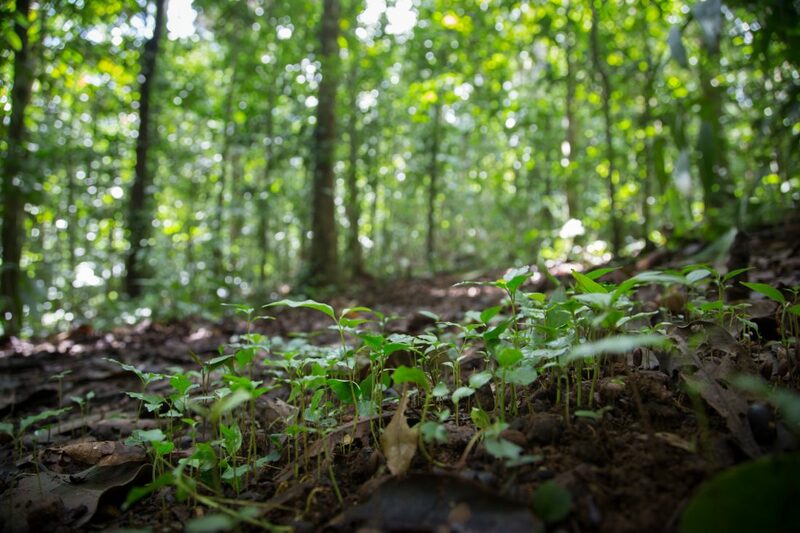 Over the past months, the Osa Verde Restoration Plots have been the liveliest place on our property. Wondering why? During this time, we have worked and successfully planted 14,000 trees! A large hard-working team is behind this incredible project. But one of the main pillars of our restoration success is Agustin Mendoza. Agustin Mendoza has worked for Osa Conservation for 8 years as our reforestation manager. One of his roles is to collect the seeds that will make up our future forests. But this is not always an easy task. To collect a biodiverse range of seeds, he must gather them from all levels of the tropical rainforest. This requires climbing trees to collect those hard to find seeds. Once gathered, he plants the seeds and cares for them until the saplings are strong and healthy. When did you become interested in reforestation? I was very young, when I was just seven years old. My father taught me how to plant and take care of trees. I used to plant different native fruiting tree species on my family’s farm. This is when I realized how beautiful and rewarding it was to plant a tree and watch it grow. 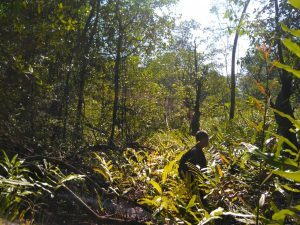 Your passion for reforestation started at a very young age: How did you come to join the Osa Conservation team? Before Osa Conservation, I worked on reforesting Cerro Osa for the founder of Osa Conservation; Adrian Forsyth. 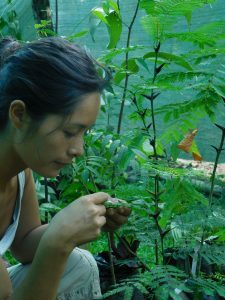 Then I started working on every reforestation project I could, planting different native tree species across the Osa. One project took to another and then I began to lead the reforestation efforts at Osa Conservation. The first trees I planted for Osa Conservation are currently 30-40 meters tall. This year, the reforestation project has taken on an innovative project with the balsa experiment. What do you think about this project? Do you like the idea of focusing restoration efforts on an experiment in hopes of future reforestation successes? 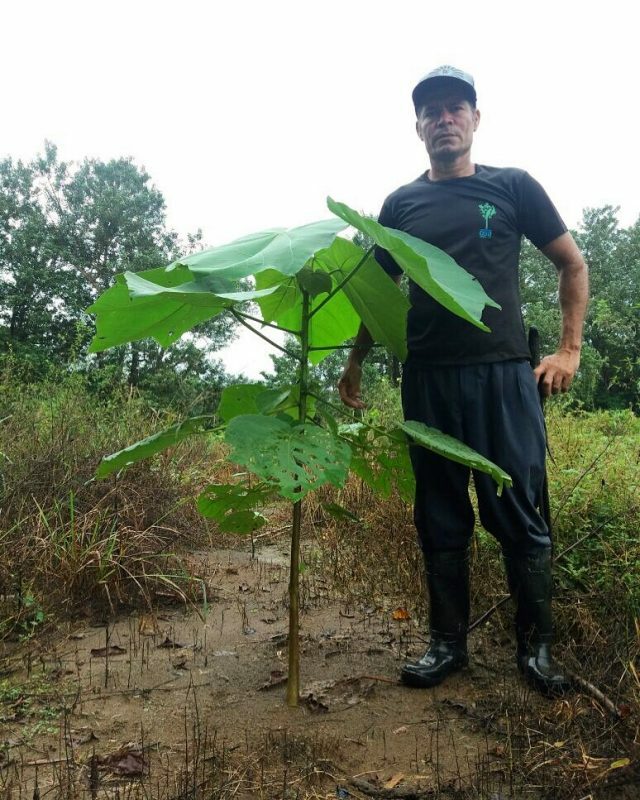 Augustin Mendoza with a Balsa Sapling. I like it a lot. I love the idea of trying new ways to speed up forest recovery and bringing back the ecological interactions you would normally find in a healthy forest. 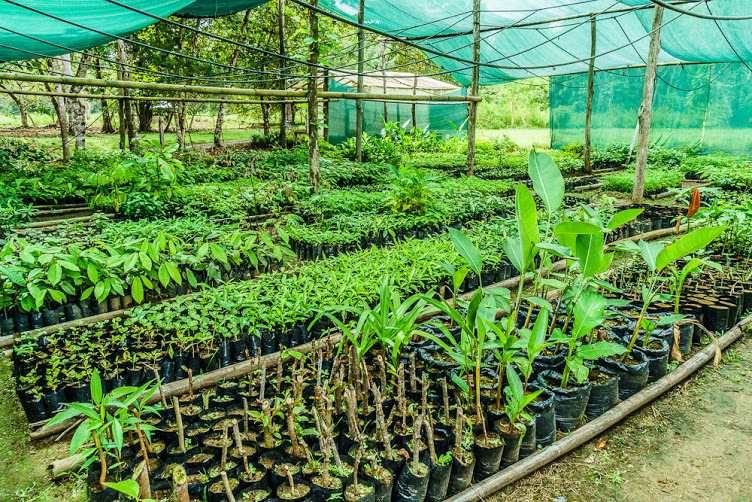 Also, with the species we have planted, they will require more care, and there is nothing I would love more than to help these little trees grow. Do you have a particular project you would like to accomplish in the future? I would love to share my knowledge with more local people. Give them seeds and show them how to grow them so they can reforest their farms. Then, everyone will see how beautiful reforestation is. Would you like to send a message to everyone who is reading this? Take care of the forest, it is our responsibility to protect it. The forest gives us everything we need without us asking; in exchange, we have to help, for nature’s well-being and our own. It’s easy, we just need to take the step and be conscious of our actions. 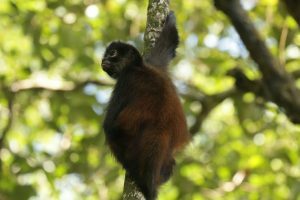 The Osa Peninsula is a stronghold for the Central American spider monkey, an arboreal acrobat adapt to navigating the rainforest canopy. Studying these dynamic mammals can be a challenge, as they don’t give up their secrets easily. To study spider monkeys, one must track them from the moment they wake to the moment they fall asleep. With the closed canopy that blocks out fading daylight from those on the ground, the arduous adventure must start the day in the dark and end it in the dark. However, the spider monkeys have a few extra precious moments of sunlight in the treetops, which ensures their escape from the prying eyes below before settling in for the night. Spider monkeys love fruit. In fact, 83% of their nourishment comes from a multiplicity of jungle fruit trees. Furthermore, the future of these trees depends on the spider monkey. 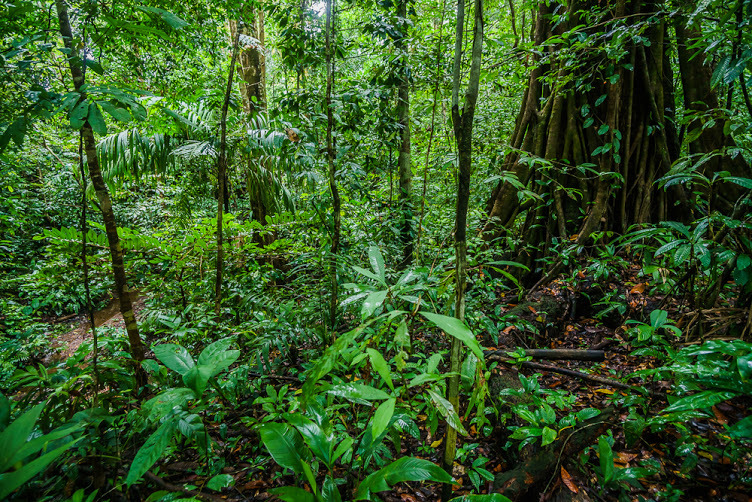 Unlike mammals, trees in the tropics must grow far away from their parents. Because of the spider monkey, their seeds are spread over hundreds of kilometers. This co-dependency feeds the spider monkey’s appetite and ensures that the fruiting trees are able to flourish. Spider monkeys have a particularly dependent genus of tree called Dialium. The Dialium grows slowly, and meticulously intakes atmospheric carbon into its broad trunk, resulting in the hardiest of hardwoods. But the Dialium seeds can only hope to start their voyage of growth if they pass through the turbulent acidity of a spider monkey’s stomach. After spending a great amount of time tracking the elusive spider monkeys, we found their secret sleeping spots. So what happens when the spider monkey settles down on a buttressed branch for the night after filling their bellies with fruit? 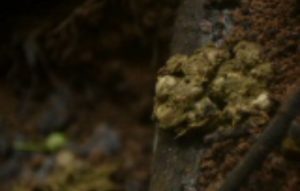 The result is not the prettiest, but completely natural: a heap of feces and seeds are scattered sporadically over the rainforest floor and understory. Though to the eye the spots where a spider monkey sleeps may be subtle, the smell won’t be. Determining the sleeping sites of spider monkeys is part one of mission ecology accomplished; part two begins the strenuous journey of climbing the trees. 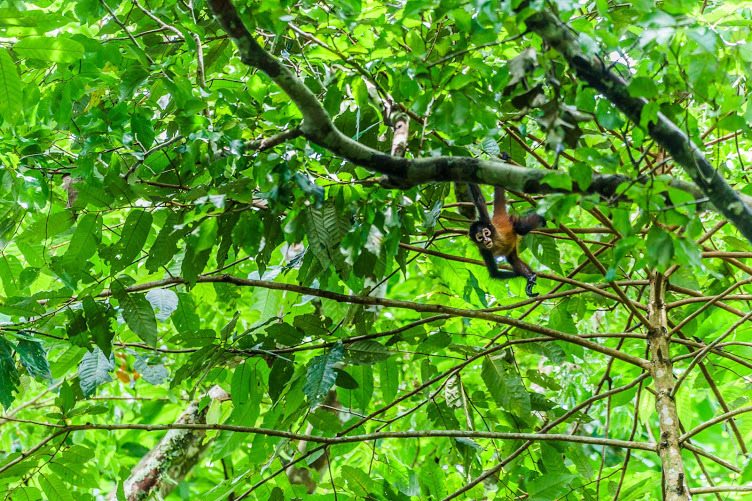 Unfortunately for the climber exploring the spider monkey’s domain, these monkeys call the tallest trees in Central America’s rainforests home. In these trees, the climbers place camera traps, our artificial forest eyes, to record the spider monkey’s activity at all hours. By doing this, we no longer solely rely on the human observer to track these important primates. Though the nature of spying on spider monkeys can sound a little creepy, we must consider their endangerment. By learning more about their behavior, we can further work towards their preservation. In fact, spider monkeys are our allies in the fight against ecosystem degradation and climate change.